Original Source Vanilla Milk & Raspberry Shower Gel – I’m trying to make my way through a massive tub of body products that I have accumulated over the years, and this was first off the rank for shower gels. This was a decent product, and it got the job done. This basically smelled exactly like a strawberry milkshake, but unfortunately the fragrance didn’t transfer to the skin or linger after a shower. I’d recommend this if you’re looking for something cheap and cheerful that you can pick up from the supermarket. 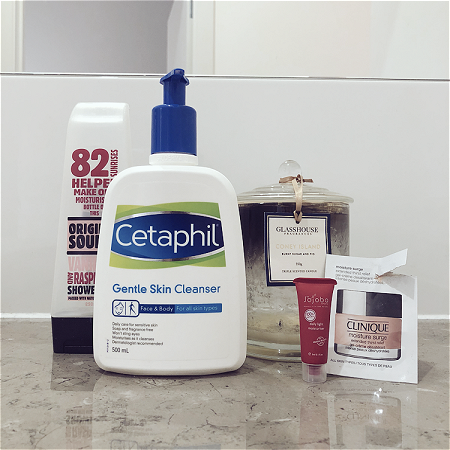 Cetaphil Gentle Skin Cleanser – You’ll notice this popping up in quite a few empties posts, as I always have a bottle of this cleanser in my shower. This is a holy grail item for me, and it’s something I repurchase all the time. If you’re looking for a really gentle cleanser that works well with sensitive skin I would highly recommend checking this out. Glasshouse Candle in Coney Island [burnt sugar and fig] – This candle smells absolutely incredible. It’s a sugary scent for sure, but the fig gives it a fresh sort of kick so it’s not overly sweet. I had this burning in the main living area of our house, and had a couple of people who came over to visit comment on how good it smelled. [sample] Jojoba Daily Light Moisturiser – I was surprised by how much I liked this moisturiser. So much so, that I was tempted to purchase a full size once I had run out of this sample. Good sense kicked in though and I remembered that I have about 10 untouched moisturisers sitting in my cupboard waiting to be used. I’ll be keeping this in mind for the future when I eventually run out. [sample] Clinique Moisture Surge – This was an okay moisturiser, I don’t remember it that clearly (unlike the Jojoba one), so it can’t have been anything groundbreaking. I know that it didn’t have a negative impact on my sensitive skin though, and that’s always a plus in my book.